Chester Heights Campmeeting is honored to be listed in the "National Register for Historic Places" and as an official project of "Save America's Treasures" We have also received Awards from The Delaware County Heritage Commission. We were originally chartered in 1872 as The Philadelphia Camp Meeting and Excursion Society of the Methodist Episcopal Church, but our history actually began nearly two years earlier in the autumn of 1870 at the Philadelphia Preacher’s Meeting. There, a group of clergymen suggested that their church purchase a grove in the nearby countryside for the religious and social use of the city’s churches and Sunday schools. A committee was appointed at that meeting to select an appropriate location, one that was not too far from the city and that could be easily reached by rail transportation. They decided to purchase the farm of Joshua and James Williamson of Aston Township, Delaware County, which consisted of 148 acres of rolling land, nearly 50 acres of which was woodland. The work of clearing the grove and preparing it for the summer season began almost immediately. The first excursion to the new Camp Meeting followed quickly. On June 4, 1872, the Ladies Aid Society of the Old Folks Home arrived with 410 adults and 70 children.In August of 1872, John Wanamaker, a Sunday school superintendent from Bethany Presbyterian Church, Philadelphia, brought 742 children. A total of 17,915 people paid for excursions to this camp meeting in the first year. Due to the influx of often thousands of people, services and businesses sprang up outside the camp meeting grounds to supply camp goers with various necessities. A post office was built near the camp meeting entrance, and businesses followed. Among the new businesses were a sawmill and a general store. In addition, the Baltimore Central railroad built a train station, just northwest of the main entrance. 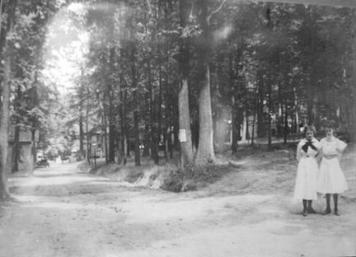 In the first year, the Camp Grounds hosted over 40 excursions, including a Temperance Harvest Home and a religious gathering from the Village Green Circuit. The first Camp Meeting (lasting ten days), drew daily attendances varying between 500 to 5,000 people, and an encampment of nearly 200 tents -- many came by rail. The Camp Meeting promised to be so profitable for the railroad company that an agreement was made whereby the railroad company would pay the Association the sum of ten cents for each child’s ticket. During the first Camp Meeting, 3,549 people came from Philadelphia by rail, 483 from Chester and 155 from Wilmington. Improvements and additions to the Camp Grounds continued steadily from the earliest times. In 1873, a large restaurant was constructed, as well as board walks and tent platforms. Over 300 feet of stables were built as well. In the same year, plans began for the establishment of a “cottage division” where worshipers lived in cottages rather than tents. The appeal of comparatively warm, dry, draft-free lodging eventually overpowered whatever attraction the tents may have had, and the year 1890 marked the last season for tents on the Camp Grounds. One tent actually remained somewhat longer; this was the large tent canopy in which the Camp Meeting services were held outdoors, in front of the large pavilion. This practice continued until the tent became too weak to use in 1944. 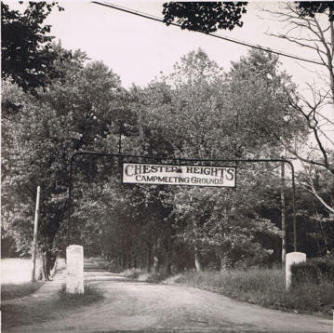 The first electric lights shone in the cottages at Chester Heights around 1915. But even with hard roads and reliable electricity, cottagers still needed to carry their water from wells operated by hand pumps until 1966. At that time, the Cottagers Association organized the installation of electric pumps, and piped the water to the cottages. The existing cottages were built between 1874 and the early 1900’s. They are predominantly Victorian in design including gingerbread and balconies. Most are two stories high, but only one room wide. In 1972, the camp meeting membership met to ammend their Articles of Incorporation and to change their name from the Philadelphia Camp Meeting and Excursion Society of the Methodist Episcopal Church to Chester Heights Camp Meeting Association, and to develop new bylaws, by which we are governed today.